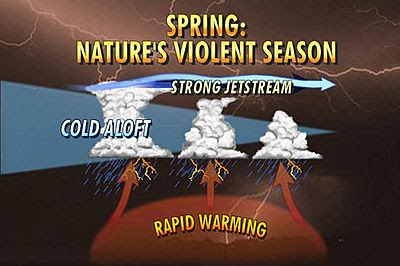 >Here is a few articles that I thought I would put on for you which describes the latest weather across the US.. A turbulent spring transition for both the US and UK… Lets hope the summer makes up for all this wild weather..
All these articles come from the AccuWeather News Center. The strongest storm in many weeks was delivering drenching rain, heavy snow and strong winds to the Northwest Monday and will spread southward and inland through the West as the week progresses. The storm will drop up to several inches of rain from the northern coast of California to southwestern British Columbia into Tuesday. Up to several feet of snow will be deposited on the higher terrain of the Cascades. 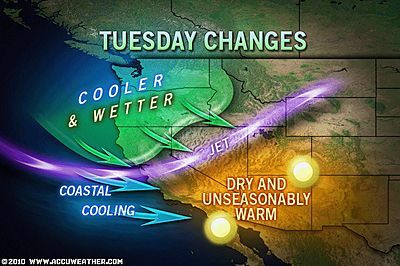 The same fate may await travelers along Interstate 80 through the Sierra Nevada in California Tuesday night into Wednesday and Wednesday night into Thursday through the Grapevine along Interstate 5 in southern California as colder air advances. The heavy, late-season snow deposited on the slopes over the various ranges in the West will boost the skiing industry. However, this storm and others to follow will disrupt travel at times, perhaps similar in scale to that at the onset of the winter. 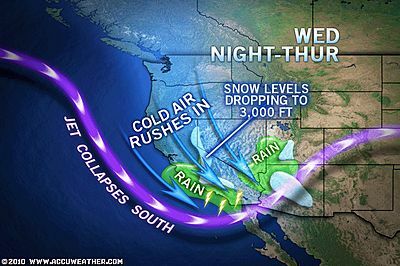 Soon after conditions improve over the coastal Northwest during the midweek, a new storm will plow ashore Thursday night and Friday with a new round of rain, snow and wind. While moisture from the second storm is likely to largely bypass much of California and the Southwest, a third storm from the Pacific Ocean may hit farther south along the California coast late in the weekend with another round of precipitation and wind. While much of the West has received greater than average precipitation this winter, amounts to date have been lower than average for a significant part of the Northwest and also farther south over the Los Angles area. The stormy pattern this week and beyond should give these areas a boost in rainfall down below and snowfall above. As we have stated numerous times here at AccuWeather.com, the dangers flooding are elevated following a late-season snowfall, as this snow is more likely to rapidly melt. The storms have the potential to lead to avalanches, road washouts and mudslides this week and beyond. As a storm system rolls ashore over the Pacific Northwest, breaks in the cloud cover can create enough instability to trigger locally gusty thunderstorms with hail and perhaps a short-lived tornado into the evening. Incidents of this nature will be extremely rare. There will be more widespread problems due to high coastal winds and gusts through the passes. 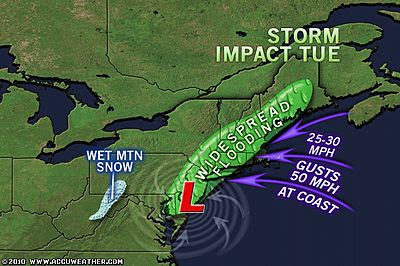 Meanwhile, in the East, a strengthening nor’easter will lead to incidents of flooding, strong winds and beach erosion. The same storm system spawned severe thunderstorms earlier Monday, but that threat has passed. Problems from the heavy rain, winds and above-normal tides will continue through much of Tuesday from northern Delmarva to Maine. A few storms in the Carolinas can briefly produce hail late this afternoon and evening, as cooler air moves in aloft. The caboose in the train of mega storms from the winter of 2009-2010 is dropping heavy rain along the Atlantic Seaboard and is in the process of triggering a new round of urban, stream and river flooding in the region. 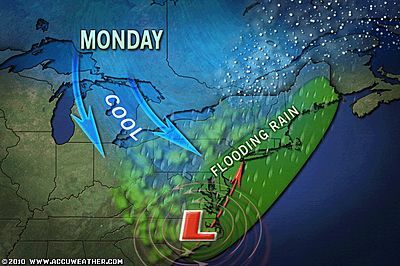 A general 2 to 4 inches of rain will fall in the coastal areas of the Northeast through Tuesday. However, some locations will receive a half a foot of rain, causing March 2010 to be the wettest or top 10 wettest Marches on record for many cities. River flooding is a concern again this week as rain falls and runs off into spring-season swollen streams and rivers. Some communities including those along the Passaic River in New Jersey that were flooded a couple of weeks ago may be flooded again. The heavy rain will lift north of the Delmarva tonight, but will hang on through much of Tuesday over New England before breaking up Tuesday night into early Wednesday. The rain will back westward into central and western Pennsylvania and New York state late tonight and Tuesday, where wet snow can mix in over the high ground. This storm lacks the intensity in terms of onshore wind and storm surge of storms in recent months. However, significant coastal flooding and beach erosion will occur. Tides, which are already boosted by the added pull of the full moon, will rise to several feet above published levels due to the storm. Soggy soil and gusty winds will lead to a few downed trees and tree limbs in New England. Beyond this troublesome storm, a dramatic change in the weather pattern will take place. Amazing warmth awaits the East during much of April. In fact, temperatures are forecast to surge well into the 70s, if not lower 80s, for the second half of the week. There is a good chance that the current storm will be the last “major” nor’easter of the season for most of the Northeast.